Brush the caps off and remove stem of each mushroom with paper towel. Discard the stems and slice the caps. Trim the ends off the wild mushrooms and cut in half, rough chop or leave whole. Heat large skillet (I prefer my cast iron), add olive oil until hot but not smoky. Add larger mushrooms first and thyme; cook over medium heat about 5-6 minutes, (giving the pan a few shakes but not over stirring) until mushrooms are caramelized and golden. Add in sherry and deglaze pan. 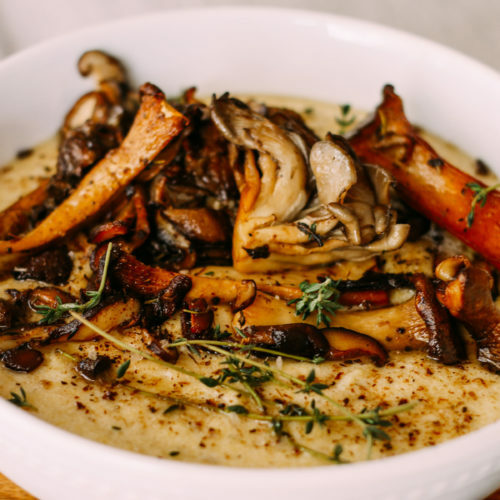 Add garlic and smaller mushrooms (if any) and cook for 1 to 1½ minutes. Add butter, swirl around pan for 1 minute until mushrooms are fully coated. Remove thyme and garlic. Season with salt and pepper. Bring the water or stock and thyme to a boil in a large, heavy pot. Add the salt. Gradually whisk in the cornmeal. Reduce the heat to low and cook, stirring often, until the mixture thickens and the cornmeal is tender (30-35 minutes if using cornmeal and 5-10 if using instant polenta). Remove the pot from the heat. Remove the sprigs of thyme, add cheese, milk and butter. Stir until the butter and cheese have melted. Season with salt and pepper, to taste. 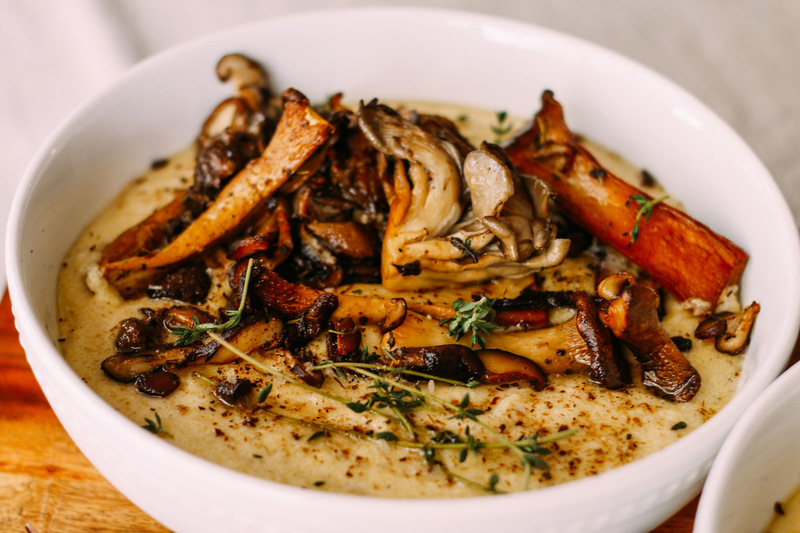 Transfer the polenta to a bowl, garnish with fresh thyme leaves and serve with sautéed mushrooms. Note: Sprinkle with The Mad Table Porcini Salt for extra flavor!